Carry Concealed in 35+ States with our Multi-State CCW class! The colors on the map show the states that will allow a NY resident to carry concealed in other states with the NY, Utah, Florida and Arizona permits, you can legally carry in 35 states with your UT, FL and AZ CCW permits! Permits Not Honored: California, Colorado, Connecticut, Hawaii, Illinois, Maine, Maryland, Massachusetts, New Hampshire, New Jersey, Oregon, Pennsylvania, Rhode Island, South Carolina. (Many of the Red states allow you to enter and say in their state with you firearms. 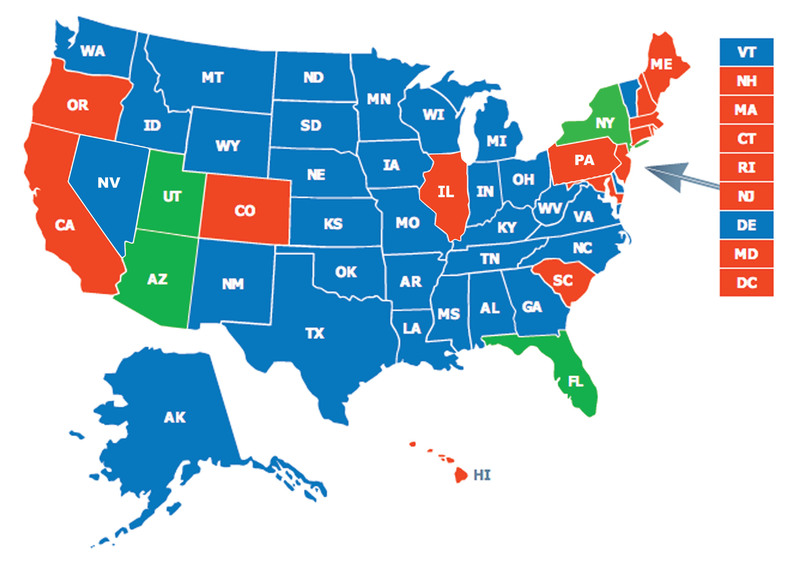 Some of these states in RED allow Open Carry. All states, by federal law, allow transport of firearms through the state under certain conditions. We will fully explain all of this in class. – Fingerprinting completed in class (for Utah and Arizona only) Florida prints are done for free by your local Law Enforcement Agency with the cards we provide you with. Class fees charged by FTWNY do NOT include individual State Fees for Utah ($67/ good for 5 years) and Florida ($92.00/ good for 7 years) and Arizona ($60/good for 5 years) due upon mailing of applications. All 3 states will send you a notice 45 days before your permit expires along with the paperwork that you will fill out to renew your permit, you will not need to take additional training when you renew your permits. To Register: Contact us at: info@ftwny.com or 716.903.2558 or fill out the contact form below with your Name & Phone Number and the Name/Date/Location of the class or classes you would like to register for.